Having established that salvation may be knowable, even when we are unable to clearly define salvation or unable to agree upon such a definition, we turn to the question of why we have been left to write our own definition. If our own definition writing requires that we wade in the oft-murky waters of scripture interpretation, then why has God failed to clearly provide such crucial information? Why didn't God just give us a dictionary if he knew the mess we would make of this? Why did he give us the Bible, filled with poetry, riddles, proverbs, songs, correspondence, code, and lots and lots of stories and parables, instead? Understand that these are types of writing not normally used to dictate precise definitions, or genres from which we expect to extract them. And why use Hebrew of all languages for the majority of this, a language known for its ambiguity? Maybe neat, theological definitions don't exist. Maybe God isn't at all eager to spoon-feed them to us if they do. Maybe they are as nonsensical as mathematical equations written to explain color. Maybe God is less interested in developing our knowledge than our character, our humility, or our relationship with him. Maybe God knows that definitions create the illusion of mastery, certainty, and control; and maybe he is less interested in being defined or understood than being known, obeyed, and loved. What definition of "God" do we find in Scripture, for that matter, and shouldn't that be even more important than understanding salvation? "God is love;" "God is spirit;" "God is a consuming fire;" "God is light." How's that for a single and clear definition of what God is? And what about Jesus? How eager was he to give key definitions? The gospels record his question, "What shall we say the kingdom of God is like?" and multiple different answers—yeast, a farmer, a landlord, seeds, etc.—but no instances of "What is the exact definition of God's kingdom?" Really, if he wanted to communicate definitions, he picked an odd way to do it. The obvious answer is that God's purpose, both for his inspiration of the Scriptures and in his glorious performance on the stage of history, was not and has never been to give us definitions, or to satisfy our desire for propositional certainty. Or, as Karl Barth reportedly said, "Jesus does not give recipes that show the way to God. [...] He is Himself the way." His purpose is that we might come to know the guide himself, rather than a map. As a result, much of our theological definition writing distracts us from God's real message and intent. And, perhaps, is as misguided and inappropriate as reading love poems for a technical understanding of how the heart works. To put it another way, the point and priority of neither God nor the Scriptures is to give us a definition of salvation that we can memorize, recite, and stick on our bumpers. 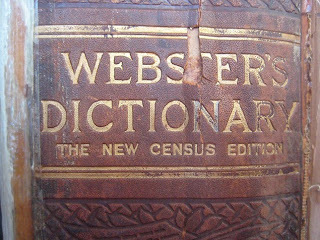 Noah Webster's contribution to the English-speaking world was a book of words and definitions. What God the Father has given to all of us instead is Jesus, the Word of God. He has spoken to us directly through his Son, that we might know him. And this is eternal life. This is salvation.